Logan loves puppets. When I pick him up from his class at church he is often playing with the puppet box. He told me, "You need make me some puppets." After reminding him to say, "please." I agreed! I loved these finger puppets I saw at Pink and Green Mama. We are reading the poem, "5 Little Pumpkins" this week. So I knew I wanted to make pumpkin puppets. I also loved this 5 little pumpkins craft I saw at Adventures-in-Mommyland and JDaniel4s Mom. I figured I could combine the 2 crafts to make just what I needed. So here are our 5 little pumpkins sitting on a gate finger puppets. The pumpkins are made out of egg cartons. They are sitting on 5 toilet paper tubes. The tubes are strung together on a dowel rod to make a "gate". He can either play with them all together or take them off and have separate pumpkin puppets. 1. Cut an egg carton apart so that you have 5 separate cups. 2. punch a tiny hole in the top and bottom of the egg carton cup. 3. Paint the egg carton cups orange. 4. While the paint is drying, glue white paper around the toilet paper tubes. 5. Punch a regular sized hole in two sides of the tube, making it possible to string the dowel rod through. 7. Tape the pipe cleaner to the inside of the toilet paper tube. The pipe cleaner is what will hold your egg cup to the the toilet paper tube. We put the pumpkins on to the rod one at a time as we said the first part of the poem. Then we took them off so they could "roll out of sight." I loved hearing Logan play with them later. He would make them say, "You scared?" "No I not scared. I have fun." And then he'd roll them away. I'm thinking you could make some interesting bobble-head dolls this way, too! This is so cute, I love this pumpkin poem and these puppets would make it even more fun to tell and for Emily to get involved with it too. Thank you for linking up to stART! Oh how cute! I can't believe that these are finger puppets!!! Great use of an egg carton. They do look like a lot of fun to make and play with. Adorable! I love finger puppets. Awesome idea! I love it! Thanks for the link love too! Oh, I love that poem- and your active way of presenting it would be great for my Little Wild Man! Those are the cutest 5 Little Pumpkins, I've seen yet - great idea with the egg cartons! What an excellent idea! Love the poem as well. My son just brought home a little egg carton spider like your little pumpkins. It was so cute, just like these. I adore your puppets! We made some last year but yours look more likely to last! This year we just taped pumpkins to wooden sticks and hold them up. Ill have to try this one. Thanks for stopping by my blog.. hope your kids like the halloween songs. 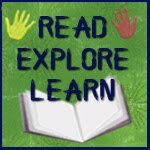 Thank you so much for linking up to Read.Explore.Learn. I love your version of the Five Little Pumpkins. They are so much fun.